Bay of Islands weddings – A Bay of Islands wedding in New Zealand takes advantage of the blue waters, amazing marine life and hundreds of little islands that shape this historic area of New Zealand. Its a photographers dream. Paihia and Russell were the original capital cities of New Zealand and were once bustling ports. Not anymore. The area has been transformed back to a very quaint and picturesque seaside town. The Bay of Islands is only a few hours drive of the countries biggest city Auckland and largest of New Zealands’ airports. It’s a very cute and fascinating place and offers lots of amazing photo opportunities. 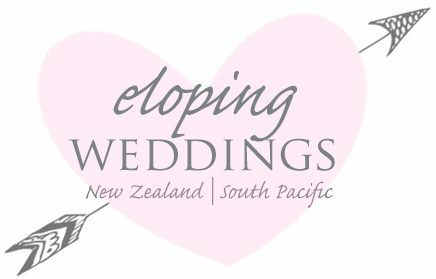 Eloping Weddings can arrange your whole wedding day in the Bay of Islands and save you money leaving you more funds for a great little New Zealand holiday. 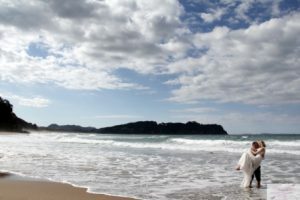 Bay of Islands weddings enjoys more natural natural highlights than any other region. It boasts more islands and bays than any other part of the country. It’s also famous for the ‘Hole in the Rock’ tours and abundance of sea life, luxury golf courses and fishing adventures. Its also the base to one of the top 10 dive spots in the World. The Bay of Islands has a year round warm coastal climate and is well proven wedding destination with lots of scenery and activities on offer. Contact us for an information pack complete with prices on our Bay of Islands weddings. We have a variety of options to contact us for your convenience. that can include all your activities and adventures.